The Jumbo-Tainer combines the easy to carry shape of a traditional jerry can with a more functional design. Boasting a huge 7 gal./26L capacity the Jumbo-Tainer is ideally suited for trips requiring lots of water. Jumbo-Tainer 26.5L Water Container The Jumbo-Tainer combines the easy to carry shape of a traditional jerry can with a more functional design. Boasting a huge 7 gal./26L capacity the Jumbo-Tainer is ideally suited for trips requiring lots of water. 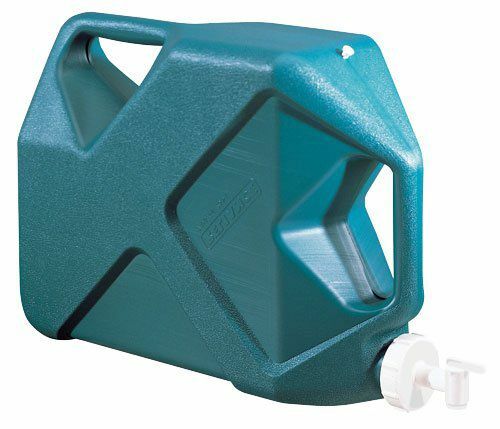 Jumbo-Tainer 26.5L Water Container is rated 5.0 out of 5 by 2. Rated 5 out of 5 by 604mark from Doesn’t leak, doesn’t break, easy to pour This is container specifically designed for drinking water. Because of two handles it is easy to pour water. Faucet is working excellent. No leaks whatsoever so far. While transporting, I keep faucet inside container so it doesn’t get damaged. Just unscrew it and screw it from the other side of the cover. Container is slim enough to fit perfectly between front and back seat of the car. I bought three of them so far and I am using them on every camping trip. I recommend this product. Rated 5 out of 5 by Juan Carlos from Superb water container for camping I bought this car camping. Brought it out twice and so far worked well. Can get heavy if the water source is far. Would like to try on a canoe camping trip. When I first got it it had a plastic smell inside. Used vinegar to kill the smell. Dulled it down a bit but the water did taste fine coming out. I'll try baking soda to really kill the smell. I like that the spigot is reversible so it doesn't break off on transport and that it's a twist so it's continuous water for washing. The only drawback I see is it really should be kept out of the sun. I had other water containers ruined because of UV damage. But overall I like this water container.